A blizzard was predicted so instead of venturing out to my mom’s and brother’s for Christmas, my husband and I stayed home and called our families today. Looking out the front window the roads don’t seem too bad, but then I watched the weather report and last night’s storm is supposedly going to whip around and get us again. We are considering ourselves snowed in (we could get out if we had to, but are choosing not to get out on the roads), I’m working on a couple of quilts. The pink, yellow, lavender and butterflies is Raising Cane, a Dorothy Young mystery. This is up through step 8 which is the last step posted so far. 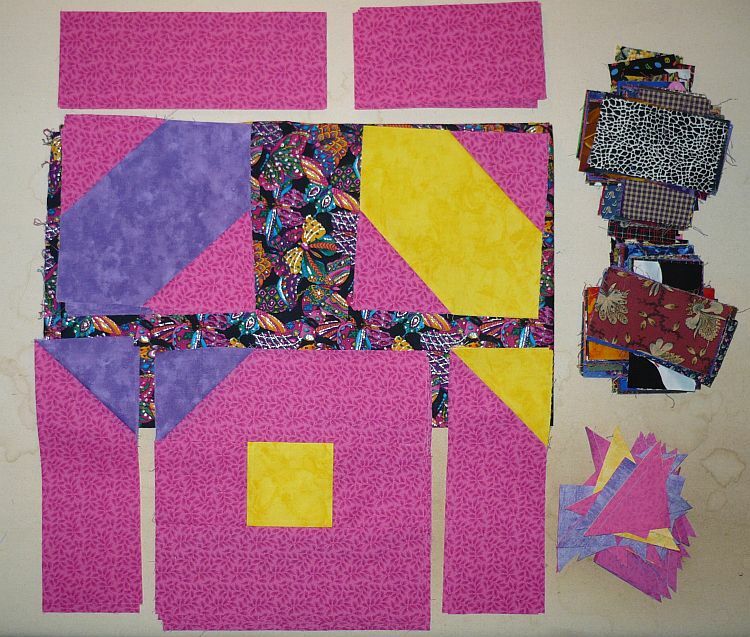 I have no idea where this is going and can’t wait to see the finished quilt. The pink on the bottom right are my ‘bonus HST’. The dark fabric is what I’m using as my leader/ender project. They are for Oklahoma Backroads, a Bonnie Hunter quilt. I’ve got the 4-patches made and I’m 1/4 of the way through the ‘picket fence’ pieces. Since I’m waiting on clues, I can either baste the music quilt together and start quilting it, or go back to Carolina Christmas. I finally decided that I really want to finish Carolina Christmas with the bright white instead of off white. So, I bought 6 yards of a bright white on white. I think it’s more than I need for this quilt, but since I only have the two pieces I’m saving for my redwork snowmen, I could use some WOW in my stash. I’d like to get both Carolina Christmas and Raising Cane to the top stage, so I’m leaning toward more piecing. Tamara at tamara quilts is starting a Wind-up for the Weekend Mr. Linky to see what everyone is planing on working on over the weekend. I’m going to play along – of course it will be interesting to see what actually gets done because I’m a great one to plan one thing and do something else entirely. Looks like you have a good plan!